No two snowflakes are alike, and our DIY Popsicle Stick Snowflake Ornament is also one of its kind! 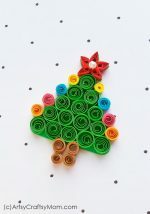 Make them in different colors to brighten up your tree! Are you having a white Christmas this year? If you are, you’ve obviously been lucky enough to experience the snowflakes falling down on you! It doesn’t snow where I live, and how I wish it did! Anyway, since I can’t make it snow here, I’ll find other ways to deal with my love for snowflakes. 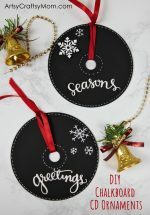 And the best way – by making a snowflake craft! One of the things that fascinate me about snowflakes is their perfect symmetry, and I found an easy way to recreate that – by using Popsicle sticks. Popsicles are popular in summer, but for some reason, Popsicle sticks appear a lot during winter too! 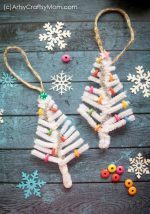 We’ve featured a bunch of cool Popsicle Stick Crafts for Christmas before, and today we’re going to add another one to the list – a DIY Popsicle Stick Snowflake Ornament! 1. If you’ve managed to find colored craft sticks, you’re good to go! But even if you haven’t, you can just color in plain sticks. You can even mix colors to make your own shade! You’ll require three craft sticks per snowflake. 2. Pinch out a tiny piece of the moldable glue, flatten it out and stick it in the center of a craft stick. 3. Place the second craft stick on the first one so that the centers are exactly aligned and the sticks are perpendicular to each other. In this position, stick the second stick on the first one. 4. Pinch out another piece of glue and fix it in the center of the second stick, like we did for the first. Stick on the third craft stick so that it is positioned exactly in between the other two. You should now have a basic snowflake shape like the one below. 5. It’s time to decorate! Bring out your shiniest, blingiest embellishments and go nuts decorating your snowflake. Be sure to place something in the center so that it doesn’t look awkward. 6. Now all that’s left to do is to attach a piece of pipe cleaner at one end of the snowflake in a loop, so you can hang the ornament. Go for the shiniest pipe cleaner you can find! Well, that’s it – your Popsicle Stick Snowflake Ornament is ready! But wait, that’s just one; now it’s time to make another one – in a different color! 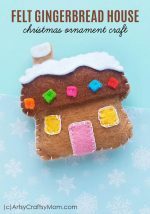 This DIY Popsicle Stick Snowflake Ornament craft is really easy and you can make several in a short time! 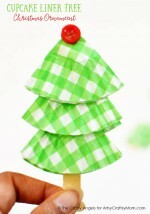 We’ve also got an easy Cupcake Liner Tree Ornament craft that also uses craft sticks. 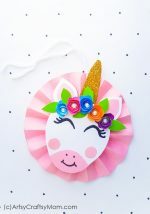 These are the perfect last minute crafts, and a good way to keep the kids busy as you get on with your holiday prep!